American Guide Series; Great Depression; New Deal; Works Progress Administration; WPA; Federal Project One; Federal Writers' Project; FWP; Poster; America; History; United States; New York Times; Review; Bromfield; Louis Bromfield. 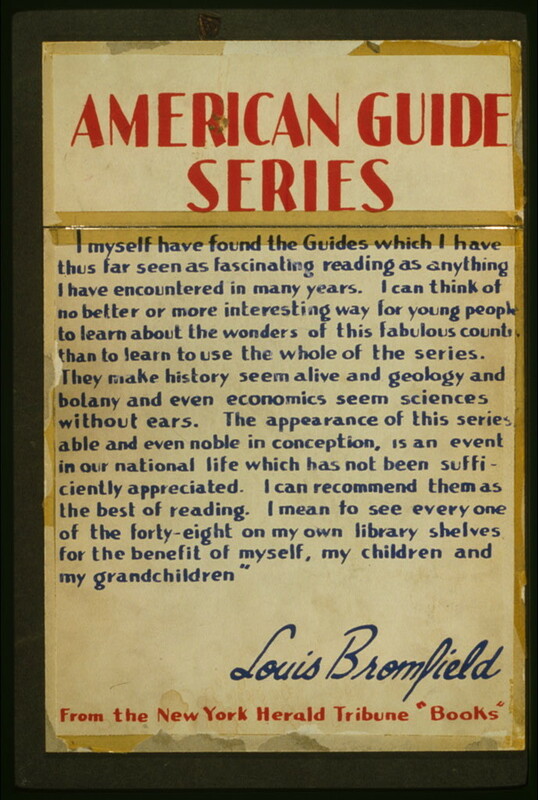 A poster from the Federal Writers' Project advertising the American Guide series featuring a quote from Louis Bromfield, a writer for the New York Times. Library of Congress Prints and Photographs Division, Unprocessed in PR 13 CN 1981:361. http://www.loc.gov/pictures/item/2001695172/. Unprocessed in PR 13 CN 1981:361. Library of Congress Prints and Photographs Division, http://www.loc.gov/pictures/item/2001695172/. “American Guide Series Poster,” USU Digital Exhibits, accessed April 20, 2019, http://exhibits.lib.usu.edu/items/show/18801.